I don’t think I’m good at it. Others might say I am. But I meet others who I think are way better at meeting strangers and establishing rapport with them. Ali Bazzi is one of those people. 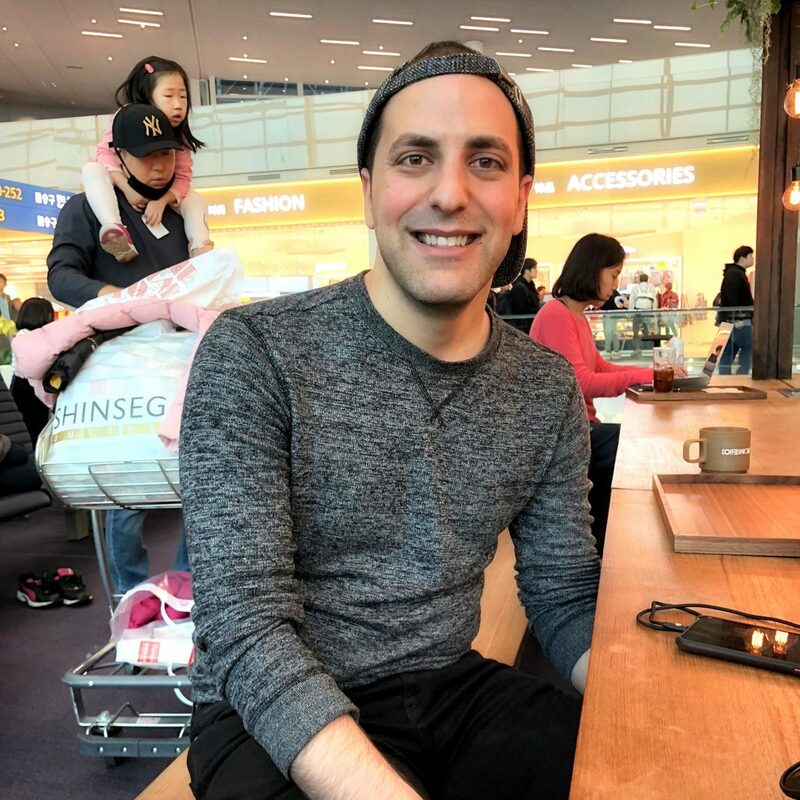 We sit at one of the picnic tables at Coffee@Works coffeehouse in the Incheon Airport in Seoul, Korea – probably the most beautiful airport I’ve seen. Ali is just now going live on Instagram. Ali has brought along another traveler he met elsewhere in the airport. Ali introduces me to her. And then yet another young man from Quebec, Canada, joins us – also a new acquaintance of Ali’s. I’m on my second international trip – ever – with my new passport. The first trip was a month prior when my wife and I visited Bangkok, Thailand for a Preview Trip provided by Apple. My wife, Noi, works for Apple. I haven’t traveled internationally since about 1990, well before the horror of 9/11 dictated the need for increased security and passports for any travel to a foreign country. And when I claim I’ve traveled internationally back then, I mean Canada, Mexico, and the Caribbean. So, I haven’t really traveled. In June, I found myself waiting in line at the Federal Building in West Los Angeles to obtain my very first passport. I’m not ashamed to say that it was pretty exciting for me. Countless movies and books I’ve seen and read portray the ultimate traveler as having at least one passport. Like, Jason Borne? Right? And now I even have a one year multiple-entry Visa for Thailand! Courtesy of Apple, again. And here comes Ali who started traveling in earnest three years ago and has visited fifteen countries since. He’s on his way to Bali to complete a trip he started last year. Ali will be scuba diving and visiting the Komodo Islands. You can follow him on his Instagram account. His Instagram feed should stay pretty fresh as he plans for two trips a year. He says he’s just a bit apprehensive about flying Wings Air which is operated by the Lion group, though, given that Lion had a crash just two weeks prior to Ali’s trip. He says when he first learned of the crash he was quite concerned. But when he found out the issue seemed to have been related to the new Boeing Max 6 planes Lion air purchased, that concern gave way to his firm belief that God is in control of his life no matter how scary things might look. I’m with Ali! Ali credits his facility for meeting and engaging new people in part to two of his favorite books, How to Win Friends and Influence People and Think and Grow Rich. Ali is an accountant… (crickets…) He says he would have gone into the medical profession but felt that being an accountant for one of the top ten firms gives him more mobility and flexibility. You know, I would have pegged Ali for a New Yorker based on a slightly sideways accent and his socially fearless tact. But he’s a northern Midwesterner like me. He’s from Michigan and I’m a Cheesehead. I like Ali. And we talk about why that is. I mean, we do have about 3 hours left of our layovers. Ali preempts me by stating that all you have to do to get people to like you is to listen to them. Ha! That’s what I was going to say. When I worked at an Apple store, I remember customers actually saying to me that that they thought I was a great guy. And I remember wondering how could they possibly make a statement like that based on a ten minute encounter selling them an external hard drive? I soon realized that even though I hadn’t spoken much, I had actively listened to them, mirroring back their concerns. It’s really the easiest thing in the world. You let the other person do all the work, prompting and probing a bit to get more information from them. And they walk away thinking you’re the best. Works for me! One more thing about Ali’s passion for traveling – he’s become an expert drone pilot in order to showcase his travels in a new way. He says that the video editing process when he gets back allows him to relive the journey. Yeah, he wants to remember the size of that Komodo Dragon he had an encounter with! Ali is actually completing this trip he started earlier because Mt. Agung was erupting in the prior year which created airport closures. And I’m proud of Ali, a gregarious and positive young man who is following his passion while being entirely responsible in his life. Ali made a conscious decision to pursue the exciting career of accounting, but he’s anything but the stereotypical vision of a person turned on by numbers or math. Note: I am open to being reprimanded over my obvious deficit in the field. Math, finances, and accounting are just not on my top ten things I’m good at or get excited about. But I am thankful that there are many who are, including Ali! It’s time to wrap things up here at Coffee@Works in the Seoul Airport. A little more sleep before taking off to Bangkok might be in order. Buy more water for the flight. Get ready to see my wife again after a month and a half away from each other. Aren’t coffeehouses great? Aren’t most people pretty interesting? Isn’t life just a great adventure when you see it as such? Ali thought his Latte was very good. Very smooth, he says. Really likes the texture of the foam and that the coffee is slightly sweet from the cream (no sweetener) and not bitter. My Americano is good, too. Definitely not bitter. I sweeten the heck out of it with Stevia packets I carry with me, though. I’ve just lost readers (if I ever had one…) like my friend Larry, who chastised me for making iced caffe lattes with Nescafé Gold Instant Coffee here in Bangkok. Come on, Larry, I’ll go through gallons of it here in this steam locker! But it’s a different experience from coffeehouses back home in the US. Foreign cafes aren’t big on having cream or other types of coffee condiments out for you to use as you like. I had to ask for cream and was given a little carafe of milk on a plate. Not enough for what I do to my coffee. And sweeteners? Forget it. Maybe some white sugar and sugar syrup. No cup quilts. If Coffee@Works could work this aspect out, they’d have my allegiance! Have to give them credit, though – they provide a number of Ethernet enabled laptops for customers. That’s pretty cool. It was a pleasure to meet you Daniel! Such a great discussion we had at the Seoul Airport. I love your writing style and look forward to reading your future posts. 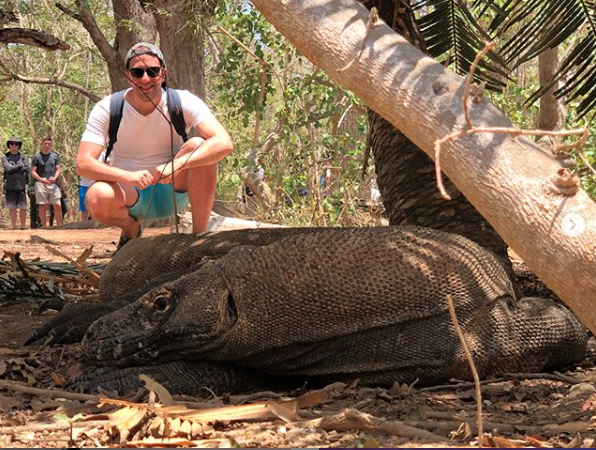 Visiting the Komodo Islands was quite the adventure. The islands host some of the best diving in the world because of their nutrient rich waters. Seeing the Komodo dragons in their natural habitat was incredible! I highly recommend the Komodo islands for any traveler seeking beautiful beaches, amazing snorkeling or diving and adventure!